If your usual glistening beard has lost its mojo and feels like a wire brush or looks like the remains of a birds nest, you need to take immediate action. Discerning gentlemen can now protect their burly friend at home, and gain grooming prowess in a quest to tame those unruly whiskers. Beard Ninja, beard oil will empower you to force rogue hairs into submission and leave you with thicker facial hair which is moisturized and healthy. Embrace your journey to becoming a BEARD NINJA. Start by repeating the BEARD NINJA mantra: Don’t just grow your beard, OWN YOUR BEARD. This natural, easy to use beard oil, should be top of your list in the battle against dry, damaged beards. Master the fine arts of beardjitsu and you will soon hydrate, soften and smooth your shoots of facial hair with deadly precision. Your passage to full beard growth and ultimate bearded glory will have the potential to bring men sporting coarse brittle, unconditioned beard to tears, as you harness the pure power of mind and beard. With just a few drops of this magic elixir, you can kiss goodbye to itching, flakey skin and so hello to your nourished, conditioned bearded face. Rich in Vitamin E, Beard Ninja, beard oil is your #1 best bro for all Beard styles. Don’t limit your after shave options by choosing fragranced products. Choose your weapon carefully and remember, the perfect beard accessory is not just a gift for Christmas, it’s just for men. Don’t go to your grave before you shave using the Beard Ninja, beard shaping template then finish with oil and a comb for sweet success. BEWARE: Legend has it, results of a perfectly cultivated beard can increase attractiveness. Be on your guard buddy, and prepare to become the envy of men. RICH in VITAMIN E, a known ingredient to help reduce beard irritation and dry skin ‘beardruff’. All ingredients are 100% natural, including Virgin Argan oil & Pure Jojoba oil. FRAGRANCE FREE, leave-in conditioner, moisturizes and protects facial hair and skin all day. 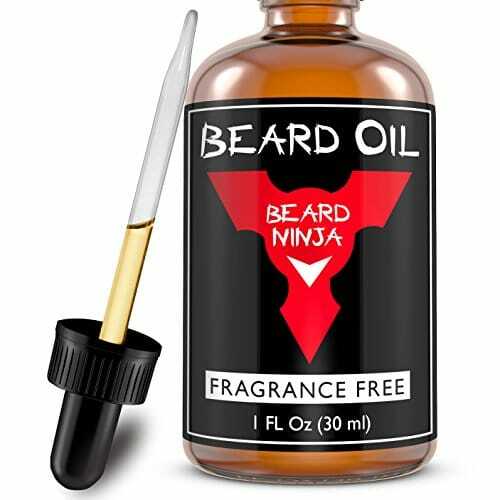 GAIN HEALTHIER, thicker beard growth by using BEARD NINJA Beard Oil daily, as part of your grooming routine. Oil tames wild unruly whiskers, and softens coarse beard and mustache bristles, for a tidy, professional looking finish. BEST RESULTS: Place a few drops in the palm of your hand. Apply deep into the beard hair and massage from skin to tip. Comb to detangle and style. Its that easy!. For the ultimate mens beard accessory combo, also try the awesome BEARD NINJA, Beard Shaping Template for perfect symmetry. 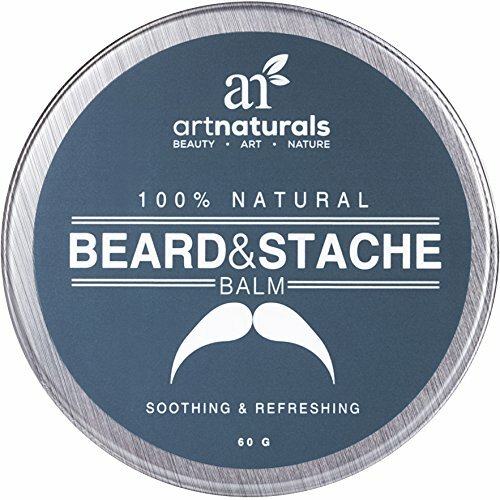 Art Naturals Beard & Mustache Balm / Oil / Wax / Leave In Conditioner 2.0 oz – 100% Natural Conditioning that Soothes Itching – Thickens, Strengthens, Softens, Tames & Styles Facial Hair Growth. Give a guy the gift of a strong stache and brawny beard with this exclusively-formulated beard balm that’s a fave with the babes. A complement to our bestselling Beard and Stache Oil, this follicle-friendly pocket pomade shapes, styles, structures, grooms, and conditions facial hairs for a polished, professional, or any “personalized” look. This superior salve seals split ends, reduces breakage, and prevents patchiness due to the beard-boosting blend of jojoba, sweet orange, and grapeseed oils. Hydrating and conditioning mango seed butter help keep skin and hairs lubricated and nourished. The light, fresh scent of sweet orange oil keeps things smelling clean and deodorized all day. Tangle-taming formula allows for on-the-fly flexibility and manageability, without any stickiness, frizz, or stiffness. Rich essential oils alleviate itch, dryness, and irritation. You’ll want to get back to your rugged roots with this whisker and woman-approved beard balm. TEA TREE OIL BALM by Chamuel-100% All Natural. Stops Irritation, Itching, and Soothes Your Skin! Extremely Versatile! All the benefits of Tea Tree Oil and more! THE MOST EFFECTIVE Ointment that will dramatically reduce inflammation and provide soothing relief for dry, itchy, or irritated skin. Great for rashes, scrapes, chapped lips, razor burn, blemishes, rough cuticles, and itchy bug bites. Money-back Guarantee! Chamuel Tea Tree Balm Ingredients: BEESWAX–acts as a protective barrier to prevent damage to your skin and also seals in moisture, SAFFLOWER SEED OIL –is a potent hydrator and ideal for sensitive skin, OLIVE OIL–does not clog pores while providing the skin with Vitamin E which helps restore skin smoothness, JOJOBA OIL–is known for closely resembling human sebum and can be used from head to toe to moisturize, GREEN TEA–is full of potent antioxidants that help soothe sensitive skin and improve the overall appearance of your complexion, TEA TREE OIL–will calmly restore balance and health to our skin while helping maintain a natural glow, LAVENDER OIL–helps normalize oil production while soothing and softening the skin, LEMON OIL–is rich in Vitamin C and increases the luster of dull skin, PEPPERMINT OIL–contains menthol that has a cooling effect and at the same time works to brighten up dull skin, and WHEATGERM–delivers a healthy infusion of Vitamins A, D, B and E to moisturize and help dry or cracked skin. ✔Chamuel Tea Tree Balm’s easy application and good coverage will calm the skin, soothe chapped lips, clear up rough heels, moisturize itchy skin with quick, noticeable results. ✔It is gentle with a clean, fresh scent. ✔This all-natural balm will illuminate your skin! 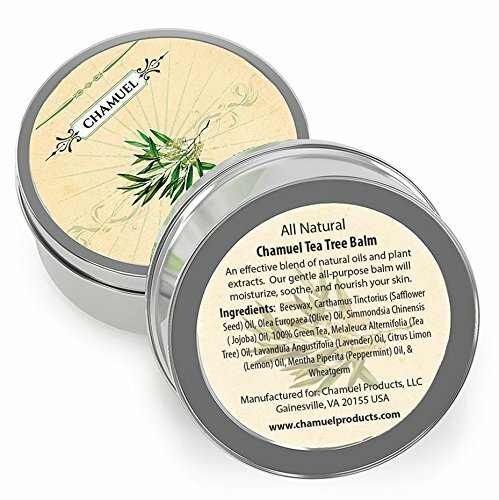 ✔Chamuel Brand Tea Tree Oil Balm radiates quality in the spirit of old world elegance! Chamuel Products is a small, family owned company with customer service as our top priority. FOR EXTERNAL USE ONLY. Apply topically to skin. QUICK RELIEF OF ITCHY, BURNING, RED, CRACKED, SORE, AND IRRITATED SKIN. Moisturizes cuticles and chapped lips, soothes razor burn, diaper rash, insect bites, itchy spots, and dry skin with a fresh, clean citrus scent. Use to massage tired, dry feet. Cool relief after waxing. Effective against athlete’s feet. A MUST HAVE in your bathroom, purse, and office drawer! Money Back Guarantee! GENTLE YET VERY EFFECTIVE! Contains no harsh chemicals, parabens, fragrances or artificial ingredients. Can be used on Children and Adults with SENSITIVE SKIN! Stop dreaming about silky, smooth skin and try Chamuel Tea Tree Balm for under $15! You deserve it! 1000’s of Happy Customers! ACT NOW….Supplies are Limited! BONUS information insert included! !